It's Buy 1, Get 1 Free State Necklaces for $19.99!! These ur popular custom state necklaces are back. Find the place of your birth, the place you grew up, where you went to school, your favorite place to visit, or the place where your heart belongs. 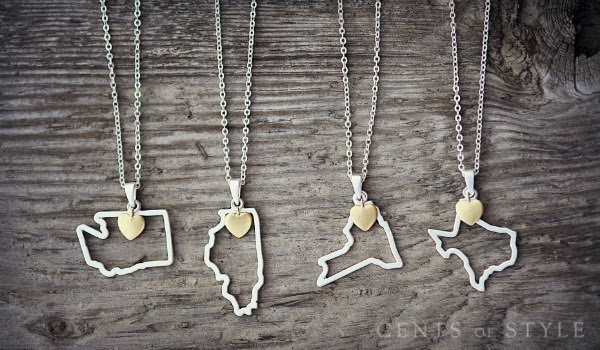 These state necklaces also make thoughtful gifts for friends & family! Here is how the code will work. The customer will add a state necklace of their choice to their cart. When added to the cart, there will be a pop up for the option of a second state necklace for FREE! The coupon code will also bring the price of the state necklace down for $19.99 at checkout. The FREE necklace is limit 1 per customer/transaction. Only 1 free will ship with each order. Allow the individual state necklace product page to fully load, then add to cart to trigger the pop-up. If you hit "add to cart" before the page is fully loaded, it may not trigger the free necklace. The pop-up will not be triggered if you use the "quick shop" feature. It has to be triggered through the full product page. We will make sure on our end that each person who orders a state necklace today, will get one free. We have our customer care team standing by to add them and make sure each customer is taken care of. This is limit 1 FREE necklace per customer per transaction. If they would like to get more than 2 necklaces, checkout in separate transactions.